Formerly a country of transition for vulnerable refugees fleeing political persecution and economic hardship in the Horn of Africa, Yemen is now home to a large number of internally displaced persons (IDP) as a direct consequence of the austere conflict between the Houthi and Saudi Arabia-led insurgents. 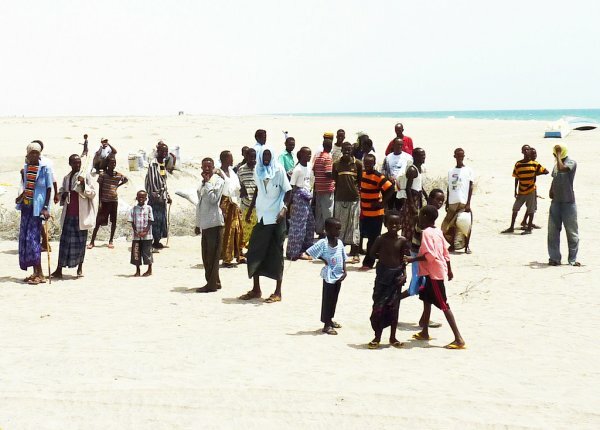 The returning refugees are being primarily resettled in Somaliland, where the authorities are concerned as the country lacks sufficient infrastructure to efficiently accommodate the mass influx. As of Aug. 2015, the Internal Displacement Monitoring Center (IDMC) estimates there are over 1,439,000 internally displaced people in Yemen—the result of conflict between Houthi rebels and coalition forces led by Saudi Arabia. Their plight has been largely overshadowed by the humanitarian emergency spilling out of Syria and ISIL-occupied regions of Iraq to the north, but the situation is no less dire. In fact, these people are so desperate to escape they are fleeing for one of the least politically stable regions on Earth. Yemen has long been a “transitory country,” as they are known, for refugees fleeing political unrest and economic hardship in the Horn of Africa—a region of East Africa consisting of Somalia, Ethiopia, Eritrea, and Djibouti. According to the United Nations High Commission for Refugees (UNHCR), prior to the sudden escalation of Houthi insurgency in Jan. 2015, Yemen was host to approximately 246,000 registered refugees, 95% of whom were ethnic Somalis. Yemenis are following in their wake. “I didn’t even know where Hargeisa or Somaliland was,” a 25-year-old Yemeni refugee named Nadia, who arrived in Berbera in early May 2015,told Al Jazeera. The former civil servant from Sanaa fled with her mother and three sisters, paying a smuggler $100 a person for a 30-hour journey across the Gulf of Aden. Somaliland’s government has recently come under fire from the international community after announcing the country would stop receiving refugee boats. Somaliland’s minister of the interior told reporters in late May that the country simply did not possess the infrastructure to deal with the influx of new arrivals, according to Middle East Eye. Though Hargeisa eventually walked back the interior minister’s statements, it is of interest that such hefty demands can be made of a nation the majority of the world’s countries have yet to recognize. This renders international aid difficult to bequeath, as most countries and major international organizations do not maintain diplomatic channels with Somaliland; and even when aid is given, it is doubly difficult to track and ensure effective employment.